so. I have done about nine or perhaps more since February and I need a break. This is for my eldest son. Each has his annual new warm hat now. Again in Quince and Co, Owl. Colour is huckleberry. I like the effect of the twisted rib against the plain purl background, but I was heartily sick of twisting every plain stitch in the hat. The colour here is fairly accurate, a deep rich blue but I put the hat on a paper serviette as a background to show off the blue. 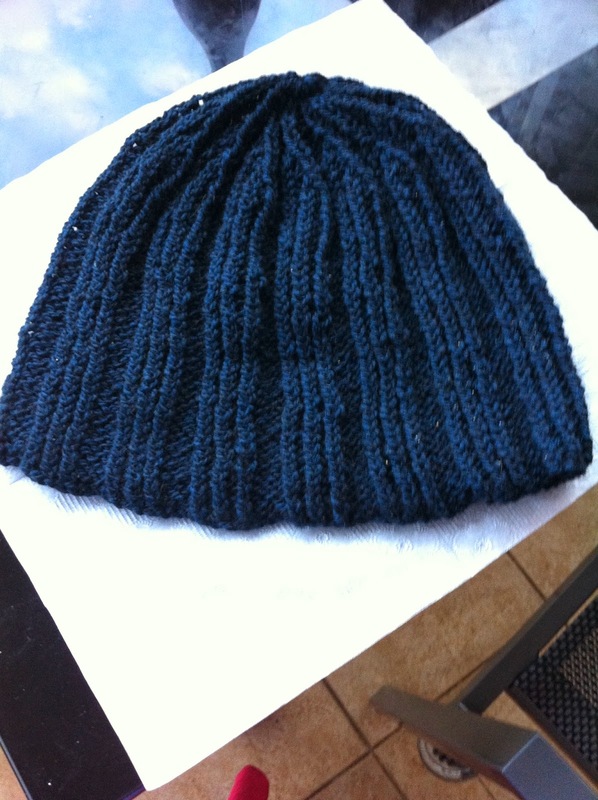 The pattern was for a child but the hat circumference went to an adult size and I adjusted the depth of the hat before doing the crown. It's been a busy weekend here. I was down south yesterday and returned to find youngest son and my eight year old grandson. He had the chance of hearing a band he hadn't heard for eighteen years. Could I mind my grandson and could they both sleep overnight. We sorted out some times and off he went to Enmore Theatre with his older brother. The son who now lives with me returned and said there was a free concert at the Opera House forecourt, so he took Master F and off they went. They both had a wonderful time listening to Australian and Maori indigenous music with some Scottish singers thrown in for good measure. He took Master F around to the Harbour Bridge and down to the Rocks area. He had a great time looking at plaques and working out dates from them. They were late back, too late really for an eight year old, but there was an extra hour sleep because of daylight savings ending. We sorted out sleeping arrangements, got him to bed, other son arrived and we had a nightcap on the balcony. Youngest son spent some time doing some housekeeping on my commuter this morning. I keep things fairly tidy, but there are areas I will not touch. I know my limits, so he sorted stuff out for me. They all then went their separate ways and I had a pleasant lunch of just ripe pears, some blue cheese and some walnuts. Very good it was too. Before they left Master F announced he had lost his gloves I made last year, could I do more? I suspect they may have been a casualty of their moving. So he drew a tracing of his hand and I'll use some of the leftover Quince and Co Owl 10 ply. They'll be striped but I think that's OK with him. Ah, that was a fatal error, saying you are finsihed with something guarantees you are not. The hat is a gorgeous colour. The extra hour of sleep was very nice. The pears are still not so good here, though I just ate a passionfruit off the vine outside and it was sweet and tasty.. You are lucky to have someone to sort out your computer for you!! And your grandson is so lucky to just trace his hand and then a pair of gloves wtll magically appear!!! You are like a port in a storm, a safe harbour for your sons and grandchildren. God bless you.